introduced a feature called Following, which lets readers publicly subscribe to your blog. Since then it's been incredibly successful: nearly three million communities in 39 languages have followers, and every second of every day, a reader follows a blog. But your readers come from across the web, from Yahoo, AOL, WordPress, Typepad... not just Blogger. That's why we're excited to announce that we've integrated Blogger Following with Google Friend Connect. Blogs that are using the Following feature have automatically been migrated to Friend Connect, so you don't need to do a thing. And be sure to stay tuned - over the next several months, there are a number of additional features coming to Blogger as a result of today's Friend Connect integration. 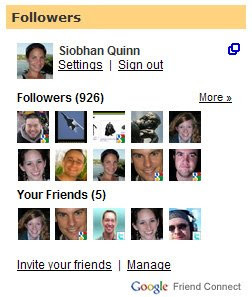 One note for readers who previously followed one or more sites with Blogger Following and joined one or more sites with Friend Connect: you can decide whether or not to show the sites you've joined via Blogger Following and Google Friend Connect in your Blogger profile. By default, we have turned the "Show blogs I follow in my Blogger profile" option off. If you change your mind, here are instructions for making this list of sites public on your Blogger profile. Update Feb. 26, 2009: For sites whose follower counts have decreased, here is an explanation that goes into more detail about the decision to make certain followers private. A few months ago, we introduced a feature called Following, which lets readers publicly subscribe to your blog. Since then it's been incredibly successful: nearly three million communities in 39 languages have followers, and every second of every day, a reader follows a blog.